Academic Jobs | Pharos University in Alexandria | Apply Now ! 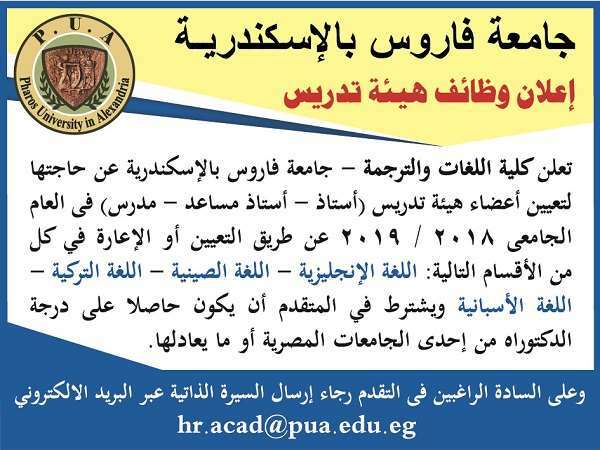 The Faculty of Engineering – Pharos University in Alexandria announces its desire to appoint a Staff Member (Associate Professor) in the Architectural Engineering discipline to work in the faculty for the year 2018-2019, who are Engineering graduates obtaining a doctorate degree from one of the Egyptian universities or equivalent, in the discipline. The Faculty of Engineering – Pharos University in Alexandria announces its desire to appoint a Staff Member (Associate Professor) in the Computer Engineering discipline to work in the faculty for the year 2018-2019, who are Engineering graduates obtaining a doctorate degree from one of the Egyptian universities or equivalent, in the discipline. Staff Members ( Professor – Assistant Professor – Lecturer ) to work in the faculty, Applicants are required to be holders of a doctorate degree from one of the Egyptian universities or equivalent. The Faculty of Pharmacy and Drug manufacturing – Pharos University in Alexandria announces its desire to appoint a number of Staff Members (Professor – Assistant Professor – Lecturer) in the Clinical Pharmacy discipline to work in the faculty for the year 2018-2019, who are Pharmacy graduates obtaining a doctorate degree from one of the Egyptian universities or equivalent, in the discipline. Applicants are kindly requested to send their CV to the following email address: hr.acad@pua.edu.eg writing the title & the discipline of the job in the Subject field. The Faculty of Pharmacy and Drug manufacturing – Pharos University in Alexandria announces its desire to appoint a Staff Member (Assistant Professor) in the Pharmaceutics discipline to work in the faculty for the year 2018-2019, who are Pharmacy graduates obtaining a doctorate degree from one of the Egyptian universities or equivalent, in the discipline. Applicants are kindly requested to send their CV to the following email address: hr.acad@pua.edu.eg writing the title of the job in the Subject field. Candidates should Hold a Master Degree from Al-Azhar University – Faculty of Shari’ah and Law – Department of Islamic Shari’ah with grade very good at least. Candidates should hold a Bachelor in law with grade very good at least or Master Degree in the specialization with a good fluency in English or French language. For the next year 2018-2019, Applicants are kindly requested to present their CV to the Dean’s office in the faculty of Legal Studies & International Relations building – Pharos University in Alexandria within a week from the publication of the announcement. The Faculty of Physical Therapy – Pharos University in Alexandria Announces its desire to appoint a number of (Teacher Assistants) for the next year 2018-2019.
who are Physical Therapy graduates obtaining a Master degree from one of the Egyptian universities or equivalent.Applicants are kindly requested to present their CV to the Dean’s office in the faculty of Physical therapy building -Pharos University in Alexandria. either by Appointment or Full time delegation. They must be holders of a doctorate degree from an Egyptian university or its equivalent.